Applications of a Portable Guard House for Industrial Operations | BIG Enterprises Inc. 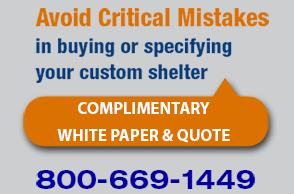 In response to market demand for more robust guard shacks, guard booth manufacturers have developed advanced designs and features. Regardless if a temporary guard house or a permanent component of the facility campus, it is imperative to choose the appropriate guard house design layout. In addition to providing personnel with a more secure and efficient work environment, the right portable guard house will enhance overall security. When it comes to industrial operations, the right guard house design layout helps amp up the security within a company. Following are some examples of how a guard shack can be leveraged in industrial business. – A truck coming onto the property of a warehouse, manufacturing plant, or factory may be innocent. However, without stopping the vehicle to verify the driver’s information and the product, there is no way to be sure. By placing a permanent or temporary guard house at the entry point for product delivery, your trained personnel can gather the necessary information and conduct a visual inspection of the truck’s contents. – With a guard shack in place, the guard or attendant can verify approval of any hard-copy documentation coming out of the company. If the business deals with sensitive hard-copy documents, guard shack inspectors can keep something from leaving in the wrong hands. Because a guard shack serves as a check-in and checkout point, your personnel can stop the theft of such hard-copy documents. – To ensure overall safety, a guard shack is often used to monitor and control bulk material handling. For example, to prevent overloaded trucks from leaving the property, the guard or attendant can review weigh bills. Ultimately, this prevents drivers from stealing material. While not a physical danger, stealing bulk materials can have a devastating financial effect on a company. building gives the trained personnel adequate time to take the appropriate action if a threat arises. Not only does a guard shack help in monitoring traffic, it also controls the comings and goings of people and vehicles. products, please visit our website.